Sitka cyclists are hardy souls, and many of us ride our bikes all year round, not just in the summer. 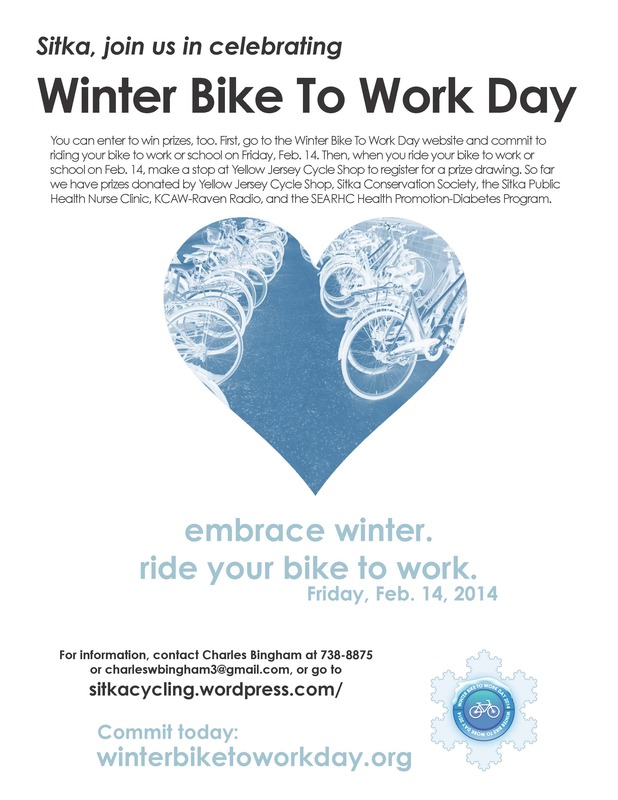 Now Sitka cyclists can ride and win prizes by participating in International Winter Bike To Work Day on Friday, Feb. 14. This is the second year of International Winter Bike To Work Day, which started when several communities in Canada challenged each other to see which one could have the highest number of bike commuters. This year the event has expanded, and Sitka and Anchorage have committed to hosting events. 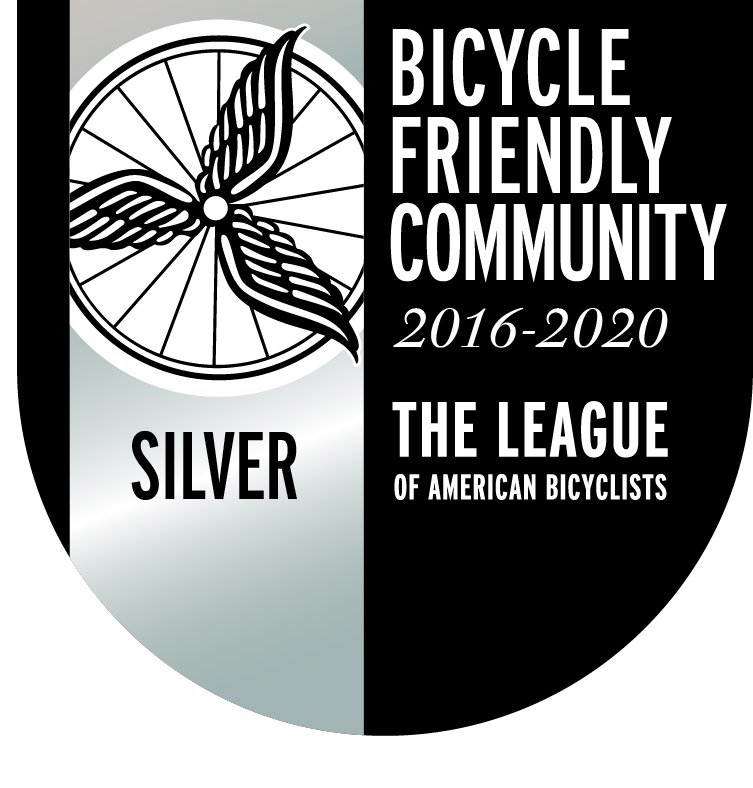 Let’s see if we can get more bike commuters on their bikes on Feb. 14, so we can beat Anchorage and any other Alaska communities that decide to participate. Our celebration of winter cycling in Sitka will be simple. First, go to the International Winter Bike To Work Day website, http://winterbiketoworkday.org/, and commit to riding to work or school on Friday, Feb. 14 (people who work at home can use a bike ride for errands or sport as their bike commute). Then, on Friday, Feb. 14, during your bike commute, stop by the Yellow Jersey Cycle Shop (329 Harbor Dr.) between 10 a.m. and 5:30 p.m. to enter your name and phone number in a contest to win prizes. We encourage all cyclists to wear helmets, wear bright reflective clothes, have working solid white headlights and blinking red taillights, and follow all rules of the road, such as riding on the right side of the road (not on the sidewalk) and stop at all stop lights/stop signs. So far we have prize donations from Yellow Jersey Cycle Shop, Sitka Conservation Society, the Sitka Public Health Nurse Clinic, KCAW-Raven Radio, and the SouthEast Alaska Regional Health Consortium (SEARHC) Health Promotion-Diabetes Program. Businesses and people wanting to donate more prizes to the event can contact Charles Bingham at 738-8875 or charleswbingham3@gmail.com for more information. 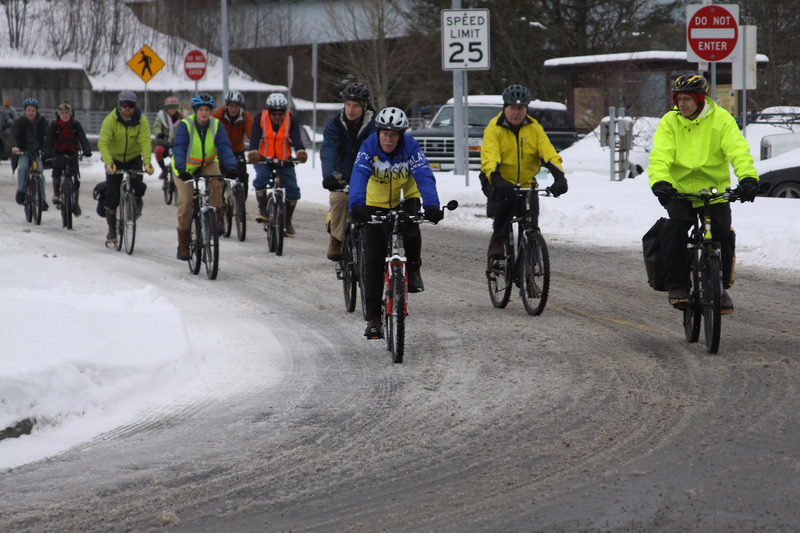 Cyclists in the 2012 Sitka Winter Cycling Celebration ride on Harbor Drive underneath the O’Connell Bridge. 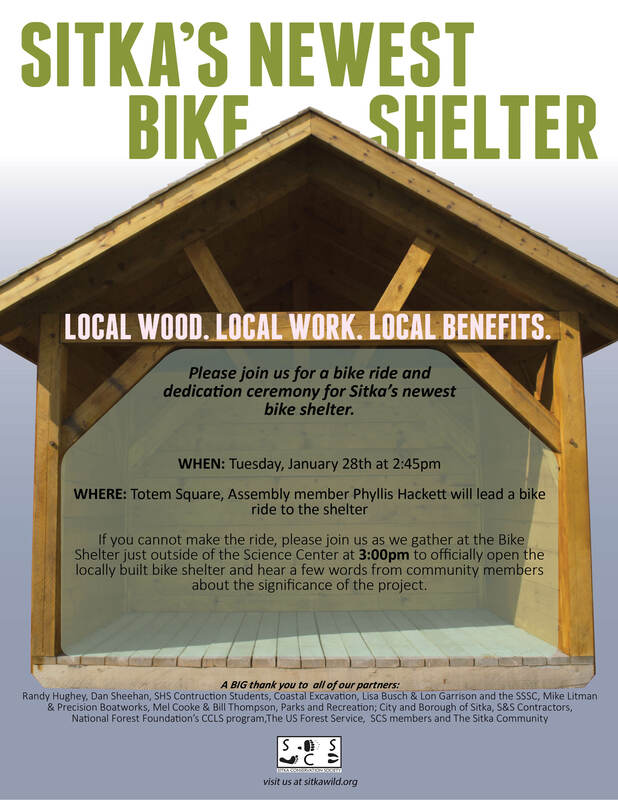 Sitka Assembly member Phyllis Hackett will lead a short community bike ride at 2:45 p.m. on Tuesday, Jan. 28, to help dedicate a new bike shelter at the Sitka Sound Science Center, with coordination from the Sitka Conservation Society. Bike riders should meet at Totem Square for a ride to the Sitka Sound Science Center where a dedication ceremony will take place at 3 p.m. The new bike shelter was constructed using local, young growth timber as part of a project coordinated by the Sitka Conservation Society and funded through the National Forest Foundation’s Community Capacity and Land Stewardship program. The project was led by Sitka High School construction instructor Randy Hughey and Dan Sheehan, who designed the building and constructed it with the help of Sitka High School students and community volunteers. The project provided local, young growth timber to students and volunteers to gain practical woodworking skills, produce a community asset, and further explore the applications of young growth timber. The shelter is a beautiful timber framed structure made of young growth Sitka spruce and old growth red cedar. Not only is the bike shelter a much needed asset, it is charming in its execution thanks to the vision of Randy and Dan’s design. Randy, who recently retired after 30 years, taught the Sitka High construction and industrial arts courses, while Dan is an experienced timber framer. The two partnered up for this project and collectively poured about 300 hours of work and dedication into the construction of the shelter along with the help of SHS students and local volunteers. Collectively, over 900 hours of work and volunteer hours went into the construction and moving of the shelter. This shelter will serve as a demonstration project, highlighting the importance of local products, local craftsmanship and knowledge, the strength of community and contributing to local economy. Multiple partners came together, culminating in a donation from Coastal Excavation who relocated and installed the shelter on Thursday, Jan. 16.The bike shelter is located near the Sitka Sound Science Center, Crescent Harbor playground, and across from the Sheldon Jackson Museum, making it ideally located to access all of these community amenities, along with the newly installed Sitka Sea Walk. For more information, contact Sitka Conservation Society Conservation Solutions Coordinator Marjorie Hennessy, or Sitka Conservation Society Executive Director Andrew Thoms at 747-7509, or contact the Sitka Sound Science Center Executive Director Lisa Busch at 747-8878. To learn more about second-growth structures from the Tongass National Forest, watch this video. 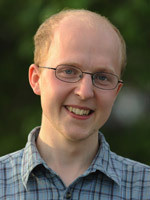 Rep. Jonathan Kreiss-Tomkins (D-Sitka) is an avid cyclist and runner, and he skippers a skiff more frequently than he drives a car. So what happened when Rep. Kreiss-Tomkins received his special legislative license plate after he arrived in Juneau for his first legislative session in 2013? 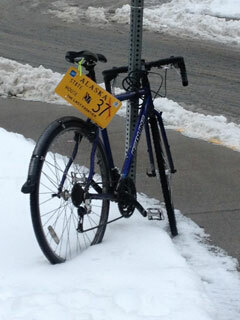 He mounted the license plate on his bike, which he uses to get around Juneau when the legislature is in session from January through April. Winter means two things: snow and the legislative session. I’m also a firm believer this is the best possible use of legislative vanity license plates. By the way, Rep. Kreiss-Tomkins built a covered bike shelter for his Eagle Scout service project that is located at the SouthEast Alaska Regional Health Consortium (SEARHC) S’áxt’ Hít Mount Edgecumbe Hospital.